This week’s column continues the series that began last summer on The Rookery, the new public golf course by Chris Adkins and Pete Oakley now under construction near Milton. Adkins and Oakley are busy with the final preparations for their new venture. Several simultaneous operations are now underway as they try to meet their scheduled opening date of July 15. A few new hires are also helping out. Oakley, The Rookery’s Director of Golf, is concentrating on the completion of the 40-station driving range. 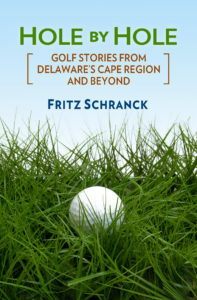 Using about 4 acres of land, the range includes Delaware’s only practice fairway bunker available for full-swing shots, according to Oakley. Oakley said the bunker wraps partially around a practice green. Golfers can hit from the bunker out to the 300-yard long range. “Most golfers should practice that shot, and they’ll be able to do that here,” Oakley said. Barry Edwards, the shaper for the construction team, will soon finish mounds and swales near the edges of the range area to provide protection for golfers on the course, especially behind the tee box for the second hole. Bunting Construction is building the combination pro shop/ restaurant. The 40- by 80-foot structure sits near the location of the old Broadkill schoolhouse. It once stood on the site along Route 16, but the crumbling mortar and rotting roof timbers prevented its preservation. The new facility should be completed in early fall. In the meantime, pro shop and snack bar operations will be handled in a special trailer to be brought on site. Adkins and Oakley also hired Richard Shilling as the assistant course superintendent, reporting to Adkins. Shilling, a Pennsylvania native, will spend the next few weeks preparing the Rookery’s bunkers. Shilling said he and his crew will be “edging and filling” the bunkers, and sodding some of the bunker areas with bluegrass. This involves careful handwork using straight-edged spades. The bunker sand came from the site itself, and meets USGA specifications. Oakley and Adkins found a huge deposit on the property when they first dug for the ponds. Oakley said the sand’s texture and playability is most similar to the bunker sand at the famous Merion course outside Philadelphia. The grounds crew will also plant floral beds around or near each of the tee box areas. Fifteen to twenty additional floral beds will bring visual appeal to other parts of the course. Adkins said some areas will use wildflower mixes. Others will feature potted perennials and ornamental grasses, such as pampas, zebra, and mondo grass. Adkins and Oakley are obviously excited about The Rookery and its chances for eager acceptance by Cape Region golfers. If the weather holds, they should be able to meet their deadline for the mid-summer opening. Shawnee Country Club held its 36-hole ladies’ member/member tournament June 1-2, using a better ball of partners format. Joan Fetterman and Vaughn Couch won, followed by Carolyn Bryan and Linda Irwin, Carol Ann Isenberg and Peg Bundek, Jackie Stipple and Marge Steiner, and Carolyn Ivins and Ann Reed. Cape Henlopen High School’s golf team finished fourth in the final state rankings for 2000, matching their finish in the state tournament.